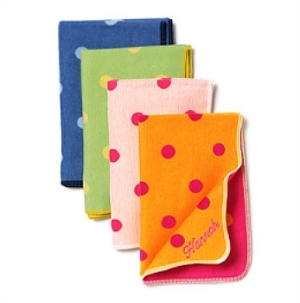 Baby blankets are on the top of the list for useful items so giving a personalized baby blanket is a no-brainer when it comes to thinking up unique and thoughtful baby shower gift ideas. There are so many ways to personalize a baby blanket. 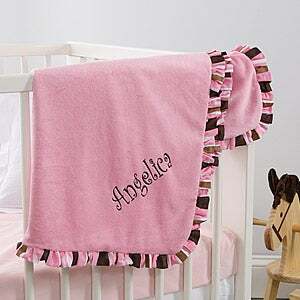 The blanket can feature the baby's name, or monogrammed initials. It could be an embroidered baby blanket or emblazoned with appliqueed letters. Or maybe even an heirloom baby quilt. I scoured the net searching for some of the cutest and most unique personalized blankets I could find. Another great baby blanket gift option is to give a handmade baby afghan, blanket or quilt. Or maybe even make your own handmade baby blanket! 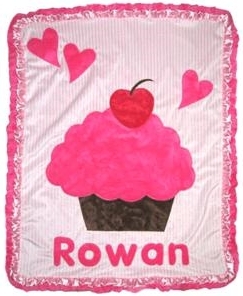 This gorgeous pink personalized baby girl blanket will be a well-loved gift! It's super soft and perfect for cuddling. I love the trim detail on this blanket and it's personalized in a really cute font. It's offered at a really reasonable price and is exactly as pictured with high quality embroidery so you won't be disappointed. It gets five star reviews from everyone who's seen it! My next recommendation has more of a homespun look to it (without all the hours of work!) - it's a personalized baby afghan in white, pink, or blue. It can be personalized with two lines of writing. I recommend having the little one's name and birthday included to be a true keepsake! I love baby things that are made with bright and brilliant colors! That's why I loved these Fussenegger Dot Baby Blankets at first sight. Baby's name or monogram will come embroidered onto the corner of each baby blanket. These appliqueed baby blankets from Pink Taffy Designs are absolutely devine, and so unique. They are available in a few other colors and patterns, and different textures as well. 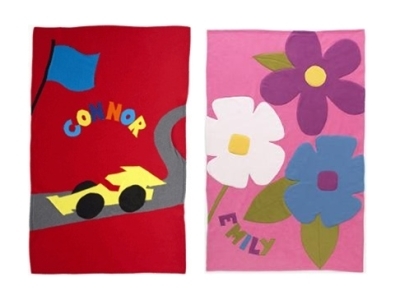 The ultimate in appliqued baby blankets! 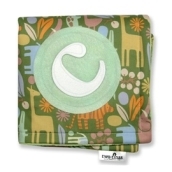 The The Ultimate Cupcake Baby Blanket is available at GotoBaby.com, along with several other Ultimate designs, such as jungle theme, teddy bears, guitars, bubbles, and sports. Very cute and luxurious! These 100% pill-free fleece blankets are so unique and beautiful! You can find these and many many other designs by shopping at OrganicallyHatched.com.